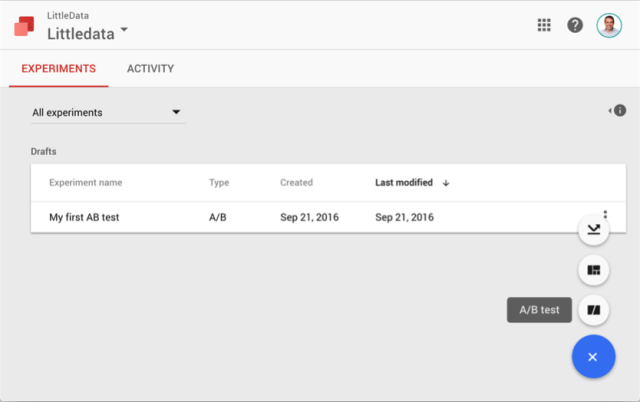 Google Optimize (standard edition) will be released publically at the end of October, allowing free access to powerful AB testing and personalisation features. 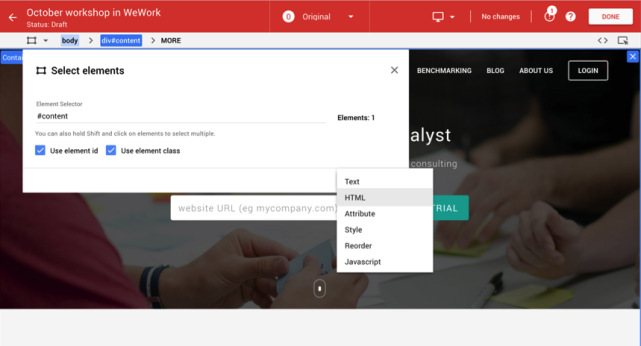 Here’s a guide to launching your first test, assuming you have the Google Optimize 360 snippet installed on your page. 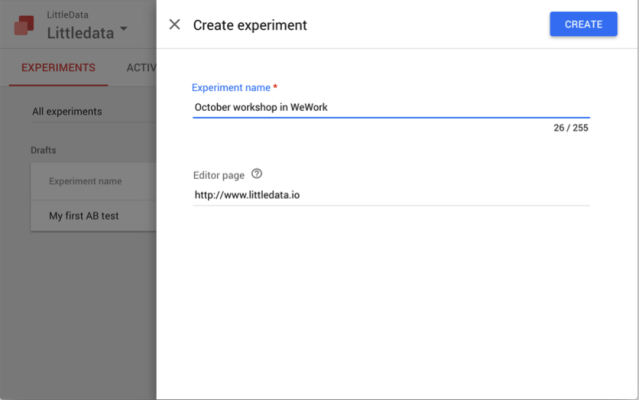 I want to trigger a personalisation on Littledata’s homepage, shown only to visitors from London, which promotes a local workshop we have running later this month. It’s not a real AB test, as we won’t have enough traffic to judge whether the banner is a success, but we can use the ‘experiment’ to launch this personalisation for a local audience. First, I need a new test (click the big blue plus sign) and select an AB test. Since I have Google Analytics linked, I can select a goal from GA as the objective. In this case, the banner will promote the event (which isn’t tracked on our site) so the only sensible goal is promoting more pageviews – but it’s possible it will also increase signups for our app, so I’ll include that as a secondary objective. Next, I need to add a variant, which is going to load my event banner. I’ve named it ‘add yellow bar’. Clicking on the variant row will take me to the editor. 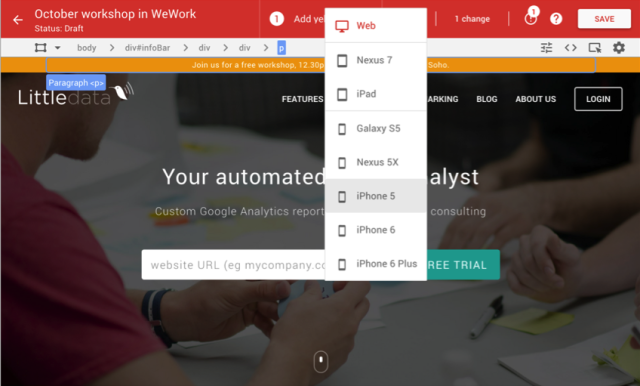 Note: Optimize’s editor works as a Chrome Plugin, so you’ll need to install that in Google Chrome first. It’s easy to select an element on the page to edit or hide, but my variant will load a new snippet of HTML code which is not already on the page. So I’ll select the element at the top of the page (with ID ‘content’) and then go to the select elements icon in the top left. Now I’ve got the right element to use as a building block, I’m going to add an ‘HTML’ change. And set it to insert the HTML ‘before’ the current element. I’ve pasted in the HTML I’ve recycled from another page. Once I click apply we can see the new element previewing at the top of the page. Next, let’s check it looks OK on mobile – there’s a standard list of devices I can select from. Yes, that is looking good – but if it wasn’t I could click the ‘1 change’ text in the header to edit the code. After clicking ‘Done’ on the editor, I go back to the experiment setup. Usually, we’d split the traffic 50:50 between the original and the variant, but in this case, I want to make sure all visitors from London see the message. I’ll click on the weighting number, and then set ‘add yellow bar’ to show 99.9% of the time (I can’t make it 100%). Then, we want to set the geotargeting. 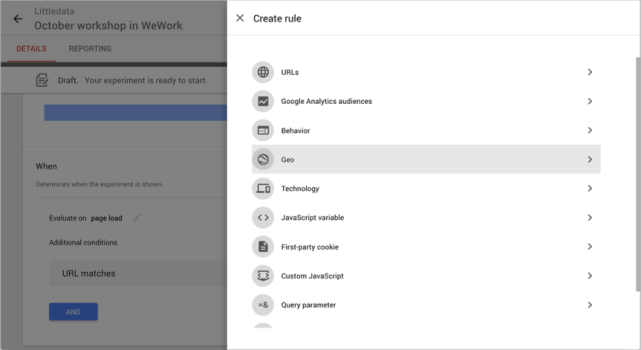 The experiment is already limited to the homepage, and now I click ‘and’ to add a 2nd rule and then select ‘geo’ from the list of rules. I want the yellow bar to show only for visitors from London. 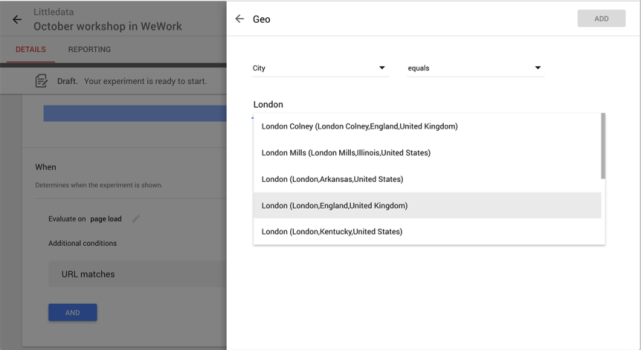 The city is a standard category, and it recognised London in the autocomplete. 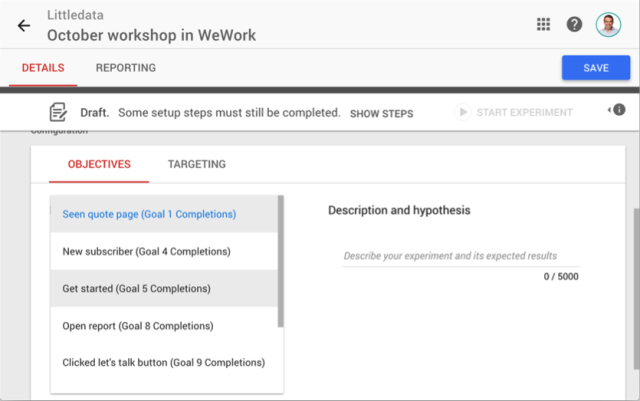 As the final step, I need to click ‘Start Experiment’. 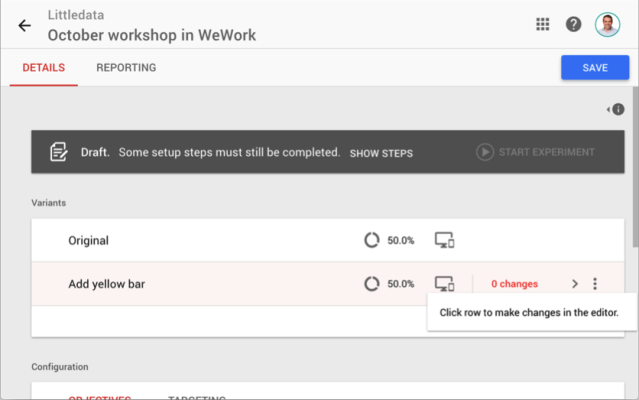 I can’t edit the rules of any running experiments (as this would mess up the reporting), but I can stop and then copy an experiment which is incorrect. 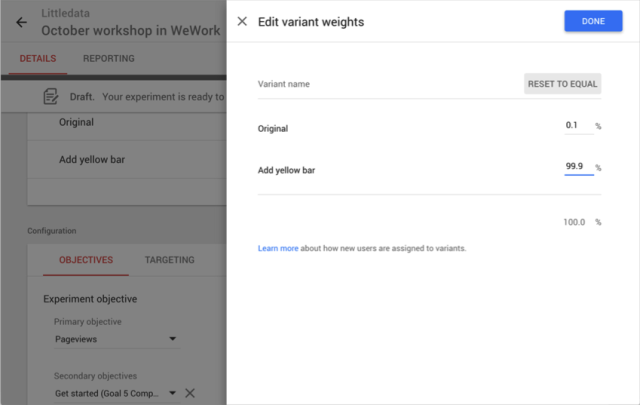 Google Optimize makes it really simple to set up tests and personalisations, although it is missing a few features such as scheduling. 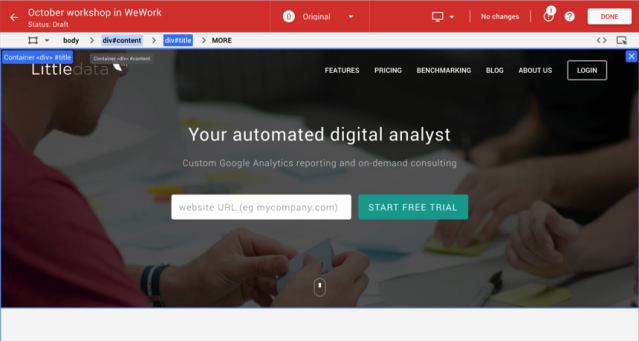 The premium edition (Optimize 360) will allow more analysis of tests using Google Analytics, and also allow the import of custom audiences from other Google 360 products. 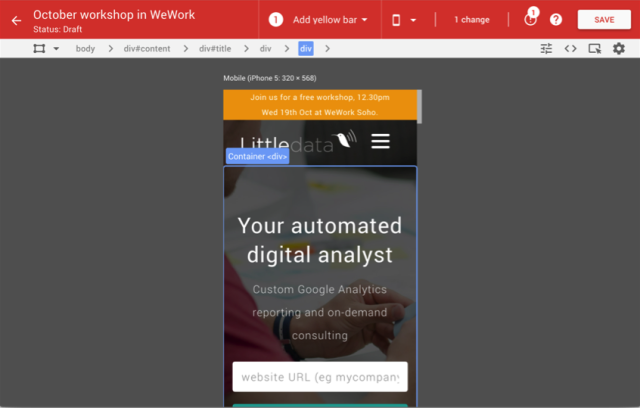 This is powerful if you want to launch a customised landing pages experience based on, say, a DoubleClick display ad campaign. So try it out, and if you have any questions, contact one of our experts!